When Autumn arrives, I find myself eating chili, soup, or a rich pasta sauce. Maybe something slow cooked or braised in my oven. All perfect to eat in the fall … all foods we love. With that said, I was in need of a slight flavor change this week. Something fresh, and light. I checked my refrigerator for meal options. “Tabbouleh! Tabbouleh will be perfect!” (I don’t go long between my Lebanese cravings). All of the ingredients were calling out to me, ready to be used. (Tabbouleh is the traditional Lebanese salad made of bulgur wheat, tomatoes, cucumbers, onion, finely chopped parsley and mint, tossed together with a lemony garlic vinaigrette.) I went to the pantry to grab my bulgur wheat, and to my surprise, it wasn’t there. No bulgur wheat!? (Insert frowning face icon here). I scanned the pantry again and found the answer… rotini noodles! Time to make my own spin on Tabbouleh. Fresh tasting Tabbouleh produce mixed with the hardiness of the pasta, and burst of protein from garbanzo beans, and feta cheese. A match made in heaven. So, on Monday night, a wonderful spin on a classic Tabbouleh salad was created in my kitchen. 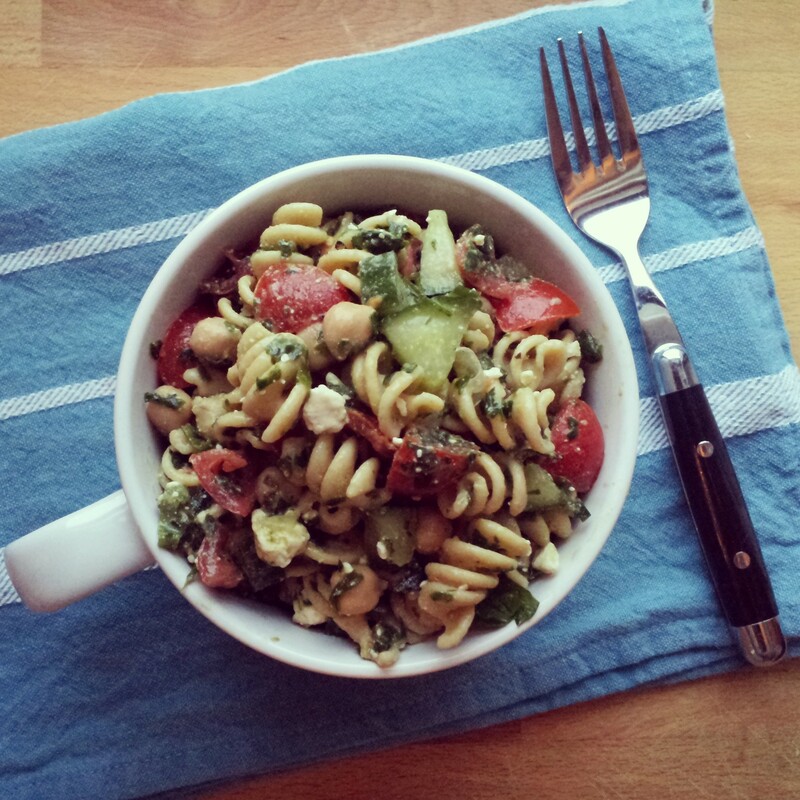 Tabbouleh Pasta Salad (with garbanzo beans and feta)! A happy addition to my rotation and a lovely change for my taste buds! Bring a large pot of water to a rapid boil. Add rotini pasta and cook for 9 minutes (or according to package directions). Drain, rinse under cold water, and reserve. Note: You will want to add a small amount of oil to the noodles to keep them from sticking together if you are not going to toss the noodles with dressing right away. Meanwhile, add parsley to food processor and pulse until finely chopped. If you do not have a food processor, this can be done by hand. In a large bowl, combine cooked and cooled noodles, parsley, tomatoes, cucumber, scallions, and garbanzo beans. Make dressing by whisking together lemon juice, olive oil, salt, and pepper. Add dressing to bowl and toss to combine. Top with crumbled feta cheese. Note: Consume salad within 2 days. I discovered that if the salad sits in the refrigerator for too long it becomes watery.